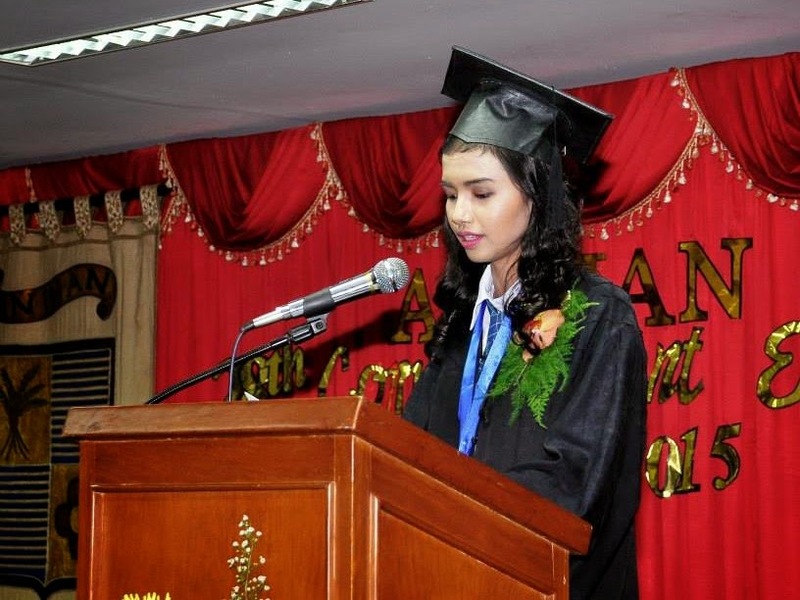 Anihan Technical School Academic Excellence Awardee and Model Student Awardee Maria Joshua Canua. I come from a family of four children and I am the youngest. I have a simple family, happy even if not perfect. I am very proud of having them in my life. My brothers are also graduates of a Technical Vocational School which is Dualtech and now, I will become part of the fruits of this kind of school and we are very grateful for that. My fellow graduates two years ago, we enrolled in this school as individuals with different attitudes, personality, strengths and weaknesses. Yes! Misunderstandings passed, forgiving each other and forgetting happened. And challenges united us to accomplish our common goal. The realization of that common goal is happening today, our Graduation. When I entered this school something was missing. 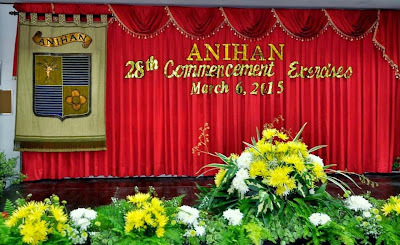 But now that we have finally graduated, I can proudly say that Anihan filled that missing part. And they gave me the key to have everything because God is with me and he is always with us. Our two years of staying here in Anihan are very memorable and valued by each one of us. Let’s start from the very beginning of our journey, do you remember every time we had laboratory classes? Gathering recipes? Our group contribution? And most importantly, the cooperation of each member of the group. Experiences in the Kitchen laboratory are very exciting. Why? Because every time we had cooking and baking we all tried to do our best to accomplish one thing but sometimes our best was not enough, so we kept on trying, striving until we succeeded and got what we really deserved. Do you also remember our Function? The preparation? The execution of our skills and knowledge that we had learned, the pressure? And the temper of each one of us? Despite of it all, we never thought of giving up. But those experiences helped us to pursue our goal and it gives us strength to continue what we had started until we finally understood the essence of hard work which brings success. We learned something new everyday. We learned from our own mistakes. We learned from the advice and opinions of others, especially from the persons teaching us. God really works through them. I am very grateful because we received a lot of opportunities and blessings as Anihan students. And I know that God has a reason why this is happening. I want to express our deepest gratitude to our patrons and sponsors, who are very generous in helping us to continue our studies and pursue our dreams without expecting anything in return. Thank you for all your support, we really appreciate it and we are hoping that you will never get tired to continue what you have started, because you are our model in helping others too. For our School Management, FPTI family, Faculty and Staff. Also to our security guards. Thank you very much for your patience, understanding and care for us. For our Teachers who helped us to become what and who we are right now, who enhanced our skills and knowledge in the field of Food Service and to become professionals. Thank you for being a good friend to us, helping us to bring out the best in each one of us. You never stopped guiding us in our studies and cheered us up when we were down. Thank you for being a second mother to us. You never get tired of giving us advice, enlightenment, love and care, despite our laziness and childishness. We are very sorry for that. We owe this achievement to you. To our Industry Partners, thank you for putting your trust in us especially in our Alma Mater. Thank you for giving us the opportunity to practice our skills and knowledge in your prestigious businesses. Thank you for appreciating the work of Anihan students. Thank you for the excellent experiences and lessons that you have shared with us. Thank you not only for training us, but also for absorbing us for employment. During these times when so many people have difficulty looking for work, we are truly very lucky to be assured of immediate employment right after graduation. For our mentors who became our very close friends and very dear to us. Thank you for supporting and guiding us in our spiritual life. Thank you for helping us to realize that the true happiness lies with God. Thank you because you never get tired and you never judge us. But instead you always give us strength and courage to pursue what we really deserve. For all the classes you have shared with us, it helped us to widen our perspective in life and to become closer to God. And sorry if sometimes we did not appreciate your efforts or ignored you on mentoring days because we said we were busy. But always do remember that you are a part of our success. Sa ngalan po ng lahat ng aking kapwa nagsipagtapos, lubos kaming nagpapasalamat sa mga minamahal naming mga magulang na walang sawang sumuporta sa aming pag- aaral at naging inspirasyon namin sa pagkamit ng tagumpay na ito. Sa lahat ng hirap at sakripisyong ginawa ninyo para sa amin upang kami ay inyong mapagtapos sa pag-aaral. Iniaalay namin sa inyo ang araw na ito bilang pasasalamat sa lahat ng pagtiya-tiyaga at kabutihang pinakita at ipinadama ninyo sa amin. Para sa aking butihing ama na si Romualdo Canua na walang sawang sumuporta sa aming magkakapatid upang itaguyod kami sa pag-aaral gayon din ang aking ina na sa Josephine Canua na walang sawang umuunawa sa amin: lubos akong nagpapasalamat sa inyo, dahil sa maayos na pagpapalaki ninyo sa amin na may takot sa Diyos ay nagbunga. Sa ngalan po muli ng mga kasamahan ko, humihingi po ako ng kapatawaran sa aking mga pagkukulang. Maraming pagsubok ang dumaan sa ating buhay ngunit hindi iyon naging hadlang upang makamit ko ang kinatatayuan namin ngayon. Dahil sa inyo. Kayo ang aming naging inspirasyon at huwaran sa paggawa ng mabuti. Ang tagumpay naming natamo ngayon ay iniaalay po namin sa inyo. Ang tagumpay na walang sinuman ang makaka agaw at tagumpay na hindi matutumbasan ng anumang kayaman sa mundong ito. Ito po ang buong-pusong pasasalamat namin at munting regalo namin para sa inyo. To my fellow graduates, let us remember all the hardships and success we had in this school. Let us remember that all these things happened for a reason: for us to become better persons, competent food service professionals and better citizens of our country. All these things start with us, with the help of our alma mater, Anihan Technical School. My fellow graduates, let us also remember that being successful is not always having everything; it is being grateful for what you have and to pass on the goodness to others. Let us never forget to look back where we have come from. My dear ladies and gentlemen once again a pleasant afternoon and thank you to all.